My buddy Berger Boy sent this to me a while ago, but I didn't post it because it doesn't quite fit the requirements for a perfect lowercase L sighting. But after giving it some more thought, I decided to share this one with you because of its uniqueness. Notice the nonsensical yet consistent styling of BElts, beginning with capitals B and E, and cascading down with lowercase "lts". I'm not sure what to make of this from both a stylistic and psychological standpoint. Did the auther suddenly forget that he was writing BELTS in uppercase letters? He obviously knows how to construct uppercase T's, as in "Table", and he can also do a nice lowercase "e" as with "Other". 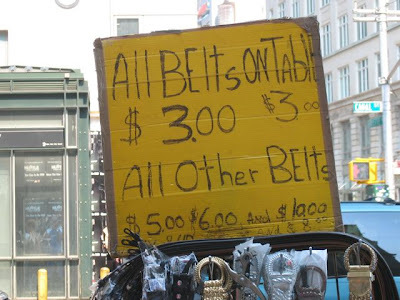 Is he tightening the BElts to fit into this sign? Maybe you can help solve this mystery. Even worse than the BElts is the TAblE on the first line.